Piriteze Allergy One A Day contains the active ingredient Cetirizine. 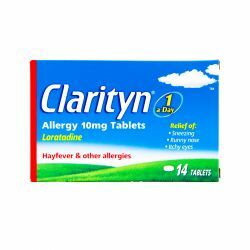 Cetirizine is an antihistamine which helps to relieve allergy symptoms such as sneezing, running nose and watery eyes. It can also be used to treat skin allergies including hives. Piriteze is suitable for use by adults and children over 12 years old. Piriteze Allergy is available in packs of 7 and 30. Piriteze Allergy One A Day should be kept out of sight and reach of children and should not be stored above 30 degrees celcius. Piriteze Allergy One A Day are for oral use only and should be taken with water. The recommended dose is to take one tablet once a day. The tablets should not be chewed. 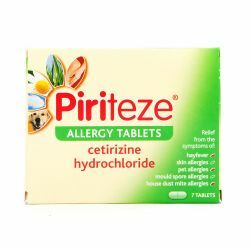 The active ingredient in Piriteze Allergy One A Day is Cetirizine. Other ingredients include microcrystalline cellulose, lactose monohydrate, colloidal anhydrous silica, magnesium stearate, hypromellose (E464), macrogol 4000, titanium dioxide (E171) and polydextrose. Piriteze Allergy One A Day should not be taken if you are allergic to any of the ingredients in the medicine. You should not take the tablets if you have had an allergic reaction to any other antihistamines or if you have moderate or serious kidney problems. Speak to your doctor or pharmacist before taking the tablets if you are epileptic or at risk of convulsions.You should make sure to mention if you are taking any other medicines, including medicines obtained without a prescription. You should speak to your doctor or pharmacist if you are pregnant or breast-feeding before taking these tablets. 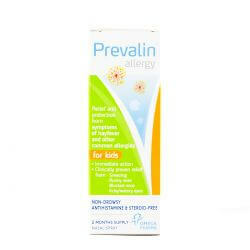 As with all medicines, Piriteze Allergy One A Day can cause side effects, although not everybody gets them. You should stop using Piriteze immediately if you notice any signs of an allergic reaction. If you experience convulsions or bruising or bleeding more easily than normal, stop taking the tablets and seek immediate medical help. If you experience confusion, hallucinations, abnormal liver function tests, rapid heartbeat or loss of consciousness, stop taking the medicine and speak to your doctor, Other side effects may include headache or dizziness, drowsines or tiredness, restlessness, dry mouth, sore throat, upset stomach, abdomincal pain, diarrhoea, nausea, runny nose, agitation, weakness, malaise, insomnia, pins and needles, itching, rash or hives, aggression, depression, weight gain, swelling, movement disorders including tremor, muscle spasm and tics, taste disorder, blurred vision, eye movement disorder and difficult, painful or involuntary urination.